Pennsylvania Dutch Potpie differs from the pot pies you buy in the frozen food section and bake in the oven (or microwave). 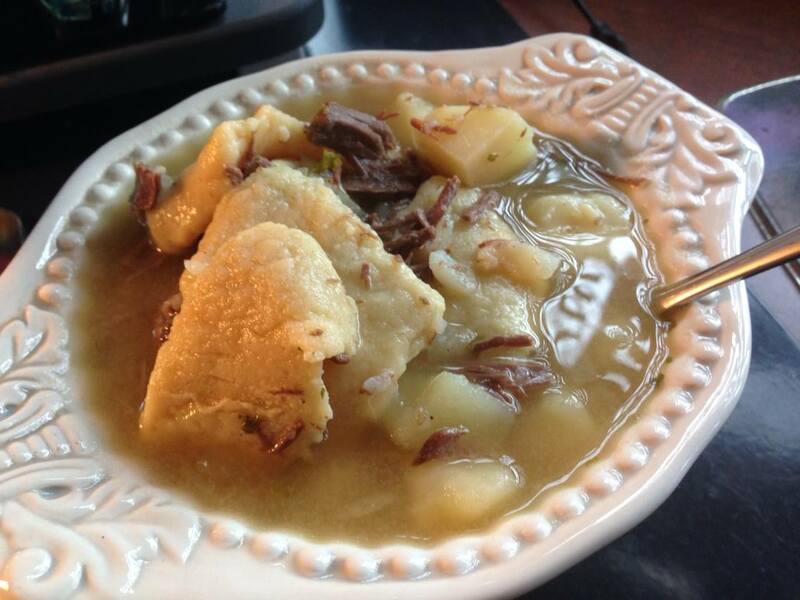 PA Dutch potpie (yes, this is the way we spell it in PA) is more of a stew with home-made noodle squares. Usually it’s made with chicken, but just about any meat works. Growing up, I’ve had chicken potpie, beef potpie, rabbit potpie, pheasant potpie, squirrel potpie & venison potpie. All contain potatoes and onions. Some put carrots in theirs, but we never did. This is the first time eating elk (thanks to Bill the Butcher)….not something one can kill/eat in PA, but common in WA. Since the elk was an extremely lean piece of sirloin, I thought stewing it would work best. Originally I was going to make elk stew, but then I thought about the potpie. Place meat in a Dutch oven and cover with water. Cook until meat pulls apart easily with a fork. Meanwhile, add flour to a mixing bowl. Mix eggs and water, then add to flour. Mix until you get a nice ball of dough (add additional flour if too sticky, but do so sparingly – you don’t want dough that is too dry). Additionally, if dough is too dry, add more water a tsp. at a time. Roll out dough to about 1/8″ thick – if using gluten-free flour, you’ll want to roll the dough between plastic wrap since it’s usually much stickier than regular flour dough. Cut the dough into small squares. One the meat is done and pulled apart, add the stock and bring to a boil. Add potatoes, onions, and dough squares in batches, stirring after each batch of dough squares (to prevent them from sticking to each other). Add parsley, salt and pepper; cook about 15 minutes (until dough squares are cooked through….pull one out and cut in half to check. They should be uniform in color – if the very middle is still darker, it’s not cooked enough).